The exhibition Living Tradition: Contemporary Ethiopian Christian Art from the Sobania Collection, on view at the Kruizenga Art Museum until Saturday, December 15, would never have happened without critical contributions from current and former Hope College students who worked together with the museum staff in various capacities as donors, artists, curators and catalog designers. 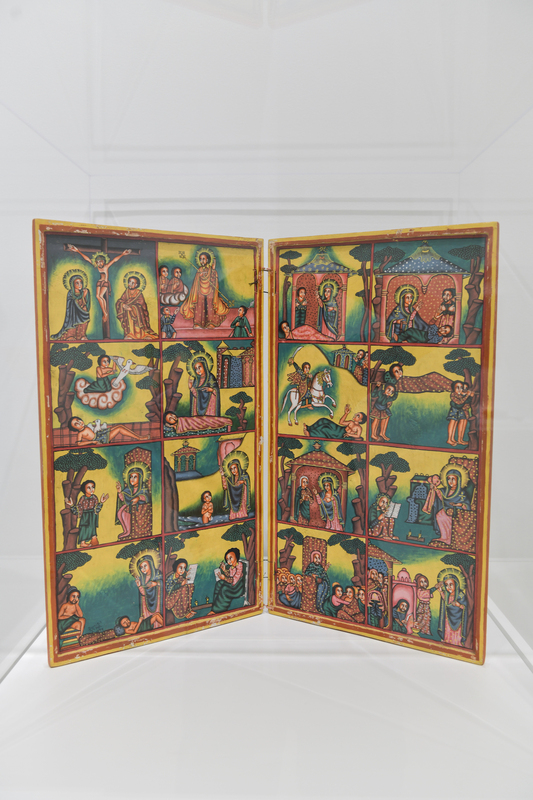 Neal and Liz Sobania donated their large collection of Ethiopian Christian art to Hope. 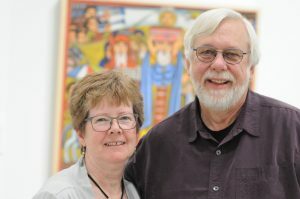 The person most responsible for the Living Tradition exhibition is Dr. Neal Sobania ’68, who, together with his wife Liz, donated all but two of the 67 artworks featured in the exhibition. After graduating from Hope, Neal served for four years as a Peace Corps volunteer in Ethiopia. He then went on to earn a Master’s Degree from Ohio University in 1973 and a PhD from the University of London School of Oriental and African Studies in 1980, where his research focused on nomadic herders of northern Kenya. Neal returned to Hope College as a history professor in 1981. He taught at Hope from 1981 to 1995 and at Pacific Lutheran University from 1995 to 2015, while also directing the international education programs at both institutions. 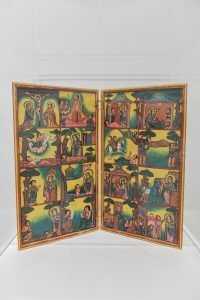 The Ethiopian Christian art on display in Living Tradition is part of a much larger African art collection that the Sobanias have been donating to the Kruizenga Art Museum in installments since 2015. 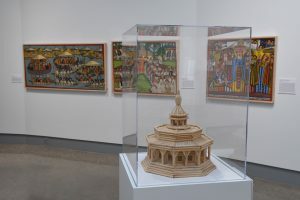 The Sobania gift is one reason why the Kruizenga Art Museum now possesses the largest, most diverse collection of African art in West Michigan. 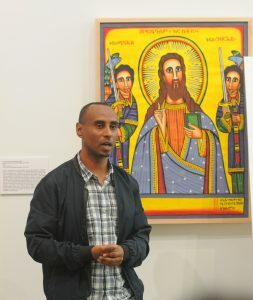 Ethiopian-born artist and 2003 Hope alumnus Daniel Berhanemeskel spoke at the Kruizenga Art Museum about traditional Ethiopian painting materials, techniques and styles. Artist Daniel Berhanemeskel ’03 painted four of the icons that are included in the exhibition and also donated a set of Ethiopian priest’s robes that are among the visual highlights of the show. Daniel belongs to a prominent family of Ethiopian religious artists and has been painting since he was eight years old. With support from Neal Sobania and former Hope art professor Del Michel, Daniel came to Hope College in 1999 to major in art. After graduating from Hope, Daniel earned an MFA degree from Michigan State University and has continued his career as a painter while also working as a computer programmer in Northern Virginia. Daniel gave a gallery talk at the Kruizenga Art Museum on September 22 that drew more than 70 people, the largest audience ever to attend a gallery talk at the Kruizenga Art Museum. Thanks to an endowment established by John H. Dryfhout ’64, the Kruizenga Museum is able to employ student interns to research its collections and help curate exhibitions. Nina Kay, class of 2019, is a current Hope College senior who is double majoring in Art History and Women and Gender Studies and minoring in Creative Writing. Nina worked at the museum as the John H. Dryfhout intern in the spring of 2018, helping to curate the Living Tradition exhibition by cataloging, researching and writing labels for all of the icon paintings in the exhibition. 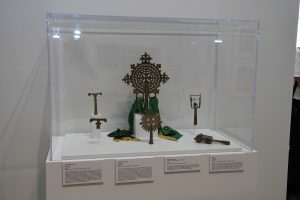 Nina’s work on the exhibition also led her to ask questions about the role of women in the Ethiopian Orthodox Church, which in turn prompted the curatorial team to add an entire section to the exhibition addressing that topic. Students have participated as curators or preparators in every major exhibition organized by the Kruizenga Museum since it opened in September, 2015. The last major contributor to the exhibition is Tom Wagner ’84, who currently works as a photographer and graphic designer based in Grand Rapids. Tom designed and produced the catalog for the exhibition. A digital copy of the catalog is available free of charge on the museum’s website and a limited number of printed copies are available for purchase at the museum. The Living Tradition catalog is the second exhibition publication produced by Tom for the Kruizenga Museum. The museum strives to produce at least one exhibition catalog every year to showcase the research and writing of student curators. 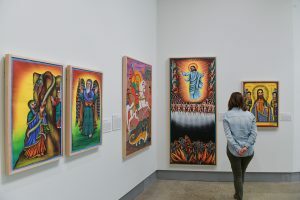 The Kruizenga Art Museum functions as an educational resource for Hope College and the greater West Michigan community. The museum features two public galleries as well as a classroom and climate-controlled storage space for its 4,000-object permanent collection. It is named in honor of a leadership gift from Dr. Richard and the late Margaret Kruizenga of Holland, both of whom graduated from Hope in 1952. Additional information is available at hope.edu/kam. The museum is located at 271 Columbia Ave., between 10th and 13th streets and is open Tuesdays through Saturdays from 10 a.m. to 4 p.m.